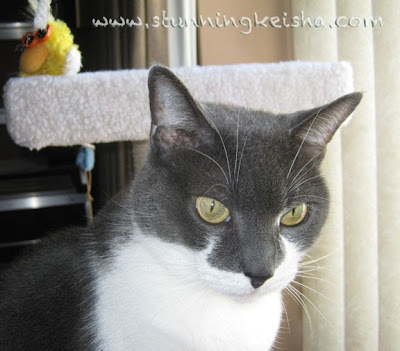 Bet you're wondering why a stunning cat with a popular blog like mine isn't at BarkWorld. Here's the skinny. 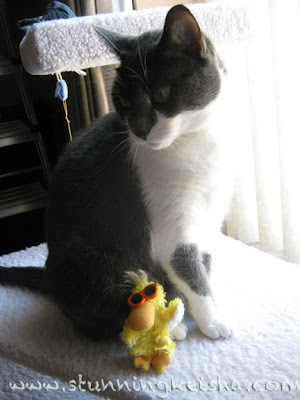 George the Duck has been crashing here since Blogpaws with the promise that we'd send him to BarkWorld this weekend. Wednesday night, Prudence's Mom came to pick him up cos she had his plane ticket and TW isn't going. TW and Pru's Mom got to talking—blah blah yakety yak—and TW forgot all about ME. Plush ME was all packed and ready to go see my furrends in Hotlanta! Whoa! How could TW forget all about Plush ME?! She's owes me big-time for this omission. Blood will be shed. George and I waiting to go to BarkWorld. If you see George at BarkWorld, tell him to bring me back something and to have a stiff drink for me. It's so hard to find good help these days. Should TW be fired for this infraction? Sigh! PS: I don't know who started this rumor but TW DID NOT GO TO BARKWORLD! She's sitting right here and, thus, cannot bring any treats back for me!! um, yeah, TOTALLY. Like, human help is SUCH trubble sometimes!! At the very, very least, demerits should be given! Oh double bummer and spit three times! Oh no forgetting your stunning plushness.......criminal. Blood should be shed. Have a fabulous Friday. Dang CK, I can't believe you are not here. Flat Brian was looking everywhere for you! How could she forget YOU? We think you won't let her forget this infraction any time soon. CK, that is just shocking! I do think punishment is in order. George sure looked like he was having a good time. No excuse for TW to forget sending Plush you to the meetup - it's just not fair. I do hope you will get even with her. Oh dear CK - maybe she needs to go the doctor. hay, hope ewe haza grate week oh end ; eat plentee oh SOLE :)!!! Oh oh. The good news is, you have Dad ALL to yourself this weekend! Of course TW should be fired! We learned a good firing does wonders for the morale around here and Jan will toe the line for a time to get back in our good graces. No, CK should not be fired. She will surely bring back lots of treat for you and a firing would just be askward. We hope you come up with a suitable revenge, CK. Here, Keisha, we've got a teleporter and we'll take you and George The Duck to Barkworld. Step right in! CK good staff is hard to find these days. I hear Glogirly's got lots of dog swag she can send you. Mom's sorry she forgot to ask about bringing your plush-self CK! It's not the same w/o you & TW! What??!?? No treats? No, something is definitely wrong here and we don't like one bit. There had better be had to make up for this! Maybe just a nice big hairball on her shoe! I bet TW will get the bitey for theese one! I witnessed George doing quite a bit of drinking!! Wish you had been there!